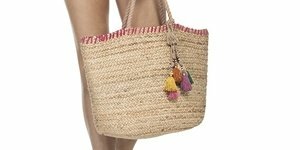 The perfect size for anything you'll need all day, the 2016 PilyQ Swimwear Belize Beach Tote Bag is a must have this summer. Gorgeous print detailed beach bag is the perfect complement to your PilyQ bikini and cover up. The 2016 PilyQ Swimwear Belize Beach Tote Bag features colorful print and ample space.